This is a cell phone display constructed of clear acrylic plastic. The display is slanted back in order to provide your customers with a perfect viewing angle. The deep pocket will hold any cell phone and keep it in place. There is an area to insert information about your product built into this display. Flame polished edges give a clean and smooth finish. We also carry versions for use with gridwall or with slatwall. This acrylic display bin is very versatile as it can be used to display anything you wish. Ideal for CD or DVD displays, this unit is available with a single (1) pocket or double (2) pockets. Display this unit on the countertop or add gridwall or slatwall capabilities. Choose from the options below. 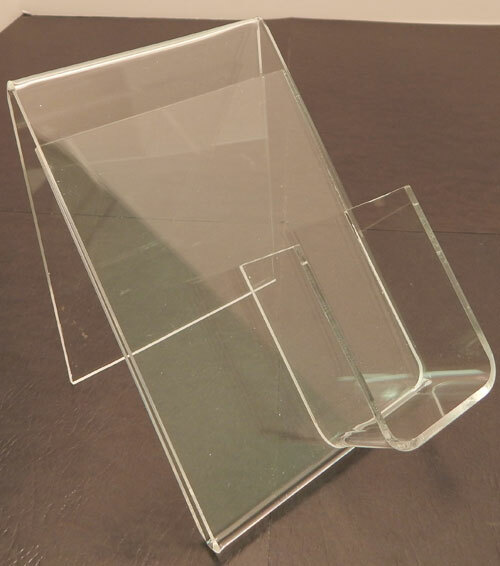 These acrylic cell phone holders are great for display case and counter top use. One piece design keeps phones securely in place. 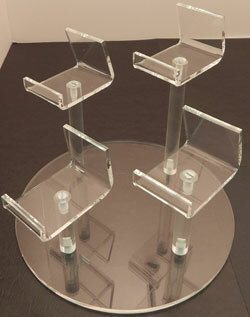 Measures 2"W X 3"D X 2"H.
Acrylic pedestal easels for the display of cell phones. Available in 3 heights, or order a set of all 3 to create a cascading display. Heights include 4",5, and"6".